"Everyone was in charge of two different notes (with the exception of our fine musician on the floor, who was in charge of three!). While this definitely made things more difficult, it was the only way to have a full-sounding arrangement with the limited head-count. Each person was handed personalized sheet music to learn their part. Once we practiced enough, we were able to put the sheet music away. 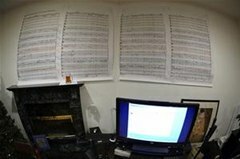 For the performance, there were large color-coded pages of sheet music on the wall behind the camera for reference…and when we say large, we mean 5' x 3' pages..."